Meanwhile a very long way away in our great nation’s capitol, Sherry Anderson (the best goddamned helicopter pilot this company ever had) had used her security clearance to schedule an emergency meeting with General Buchanan “Barnstormer” Doyle at the Pentagon. While Rick Ironside waited outside in the Pentagon parking lot to lean against his motorcycle and pick his fingernails with a bowie knife, Sherry entered Doyle’s office. There, she was surprised to discover an old enemy. “Alive and well Ms. Anderson, alive and well!” exclaimed Killstryke happily. General Doyle cleared his throat and felt the fabric of his chair. He loved the fabric of his chair. “John Killstryke is my special advisor Ms. Anderson.” said Doyle. “So…” said Sherry “We meet again Colonel Killstryke. How’s things?” The Colonel gave a menacing smile. “Tangiers.” said Sherry. “Remember the girl from Tangiers? Do you remember her, you lousy murdering scum?” The Colonel started to laugh in her face outright. Sherry growled and leapt at the Colonel only to be trapped in a Super-Secret-Shaolin-Hold known only to select higher ups in the U.S. Army. “Still too fast for you Ms. Anderson!” said Killstryke victoriously. Sherry rose from the floor and seated herself in the nearest chair. “Now what’s all this about, son?” asked General Doyle. “Sir I demand that you stop the countdown for the Boston warhead!” said Sherry, pounding her fist upon the table. “If it’s launched countless will die, including several off-and-on-again-co-workers!” The General nodded silently and sighed. Colonel Killstryke sneered. The General looked unimpressed. “Mitt Romney is dead sir! The city is in chaos! The evacuation hasn’t worked!” shouted Sherry. The General shook his head sadly. “Romney’s dead, ‘eh? A shame. He was a good soldier. Still, my decision rests. In under two hours, Boston will be no more.” Sherry was speechless. “I already have. The EPA agent assured me that radiation is the only way to properly destroy zombies. Now, that will be all Mr. Anderson.” Sherry stared. “Radiation?… That’s probably the worst way to get rid of zombies!” The General yawned and started walking out the door. “With pleasure sir!” said the Colonel. Sherry bristled as the Colonel walked her out of the office. She stopped abruptly as she felt the point of a knife in her back. “You swine.” uttered Sherry. Leaping into the attack, Sherry knocked the knife out the Killstryke’s hand and broke his nose with her first punch. With her second punch, she had smashed him into the drink dispenser, and with her third she had cracked four ribs. Furious with the malice and cruelty of her hated foe, Sherry pulled out her Beretta. She lifted the bloodied Killstryke against the wall, and held the handgun to his head. “Think about it Ms. Anderson! You kill me and you’re no better than I am! Just another killer in a world drowning with blood!” Sherry frowned and clicked off the safety. “I…I knew you wouldn’t kill me!” screamed the Colonel. “You’re not strong enough Anderson! You’re not strong enough!” Sherry whirled around at lightning speed and hurled her machete into the Colonel’s sternum. Sherry’s most righteous defeat of the nefarious villain was interrupted by the skull-splitting noise of the nuclear readiness siren. Sherry’s blood ran cold. The missile was about to be launched! Racing through the hallways of the Pentagon and jumping through the entrance doors, Sherry ran to the parking lot where she could just see the rooftop of the Pentagon sliding back and a gigantic warhead rising up. She sprinted through the maze of parked cars searching someone who could somehow help. Finally she saw Rick. “Rick!” screamed Sherry. “Do something!” Rick looked up and saw the great Harbinger of Atomic Death. Enraged, Rick Ironside wasted no time in whipping out a can of gasoline and promptly lit his motorcycle on fire. 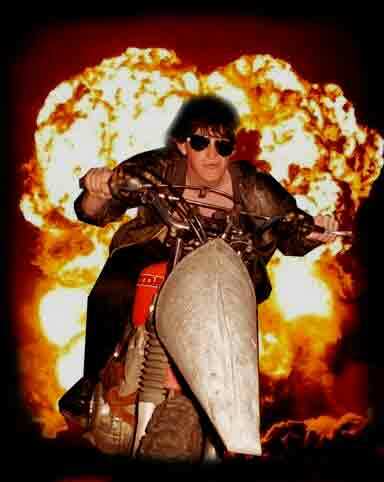 Mounting the flaming Harley, Ironside narrowed his eyes behind his aviator sunglasses and studied the screaming thermonuclear warhead as it blazed into the sky. Taking aim and with a blood-curdling death-cry, Ironside used a car as a jump, which promptly exploded, hurling Rick and the motorcycle at the missile. His plan worked flawlessly, knocking the missile off course and causing it to land and detonate harmlessly many thousands of miles away in Burlington VT. Rick fell from the great height and landed on a pile of stuffed animals. Rick Ironside issued a satisfied grunt, and turned to light a cigarette as he began the walk with Sherry back to the helicopter.